Generally, you might see special birthday posts about stylish presents and desires that have been generously fulfilled on one’s special day. And, even though I did receive wonderful gifts and tasteful pieces (which I’ll be wearing later) on my own special day, I thought I would do a different post. 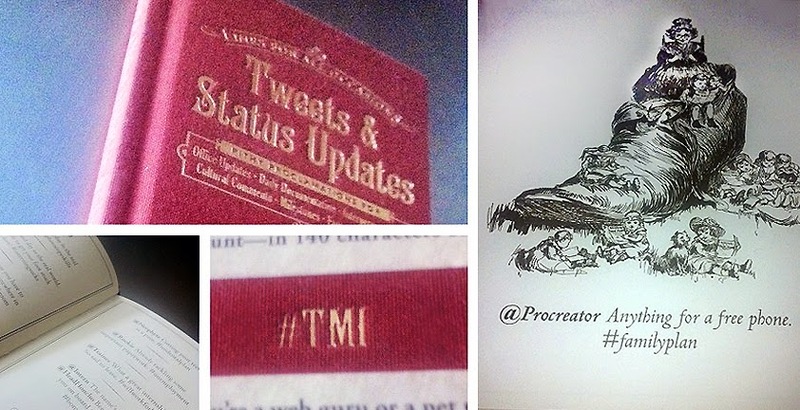 Here's a fun little gift that I received from my sister, the Lines For All Occasions: Tweets & Status Updates book. Initially, it was supposed to be one of my entertaining introductory gifts—you know, those items that are in a type of grab bag that’s not to be taken too seriously. Upon opening the most important bag of festive goodies, I just couldn’t help but love this pocket-sized book! If you’re on Twitter or Facebook, then you will understand. The book caters to the art enthusiast, gastronome, techie, bookworm, and many others! It has lines and Tweets that are both, full of vigour and amusement. 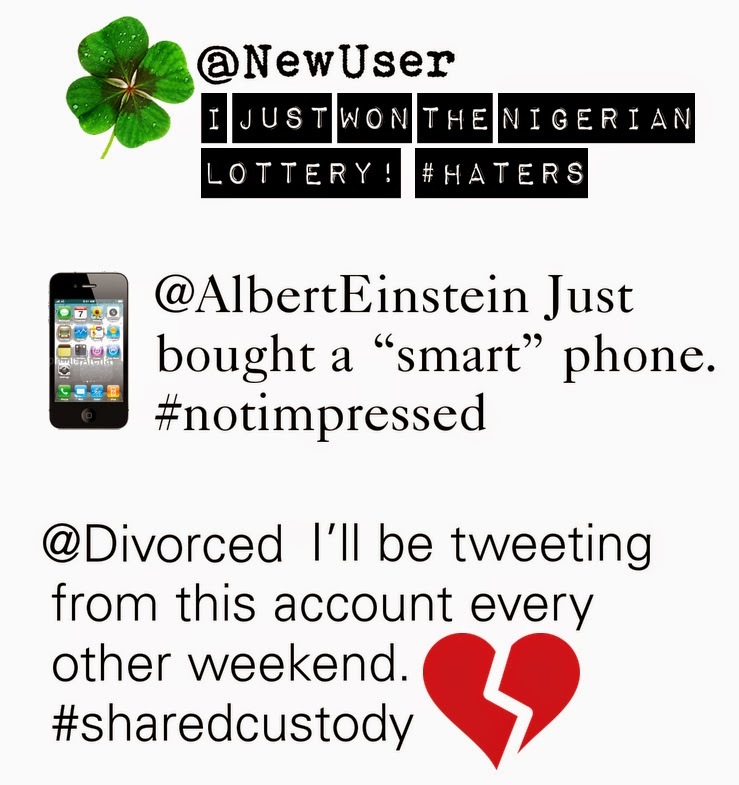 There’s even cheeky lines from celebrities’ status updates to comical Tweets from the deceased (think, Jane Austen or Salvador Dali living in the twenty-first century and being on Twitter). The book is a sheer hilarious and clever introduction to understanding how powerful social media is, namely Twitter. Brief tweeted installments in the book feature topics about, oversharing (ahem, #TMI), ghost Tweets, gossip and rebuttals, and Twitter etiquette, amongst many others. However, there’s also excerpts with a bit more substance—some offering ways to promote yourself properly online, or rather what to avoid. Other famous communiqués provided are examples to learn from … and then there’s the little fact tokens of enlightenment. Be it your “how-to” guide to crafting your next Tweet or witticisms to make a note of for the next time you see a friend’s status update, the book indeed is one to remember for stocking filling season! I’ve assembled numerous quotes and status updates that were some of my favourites, of course there were far more to enjoy with a quiet chuckle here, or a shaking of the head there. But, listen, if you have time to spare this would definitely be an alternative way to rest your head from the crosswords or Sudoku puzzles. 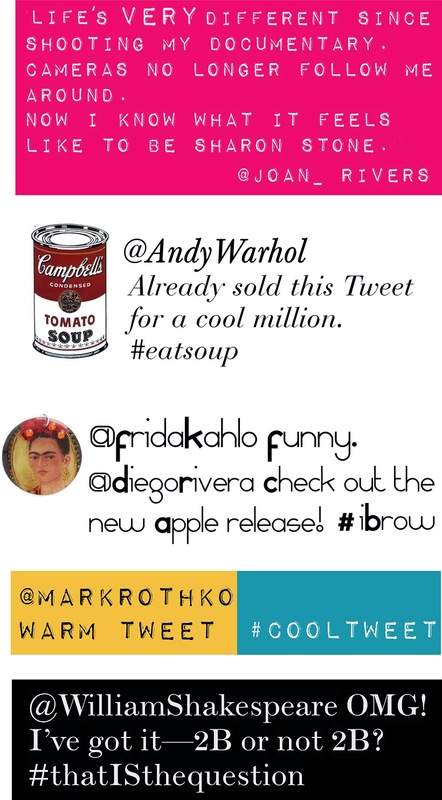 All tweets in the images above are from the book, edited by Fashion Tales. *Buy it here on Amazon or AmazonUK here. Haha, this looks so funny - it's the first time I heard of it! Nice gift from your sister! Enjoy! This sounds ridiculously entertaining - I need it in my life!! This certainly sounds cool! I will have to check it out. Thanks for the intro. This is such a great post I found it really interesting. Adore this post, make my day so much more brighter! I enjoyed reading your thoughts on my last post. Have a splendid weekend! The Claude Monet one killed me! What a clever little book! Oh this book sounds so witty and fun! I have a few friends who work in social media who'd probably get a real kick out of it. As I said on FB , I must get my hands on this witty book. OH Kanye what a life? 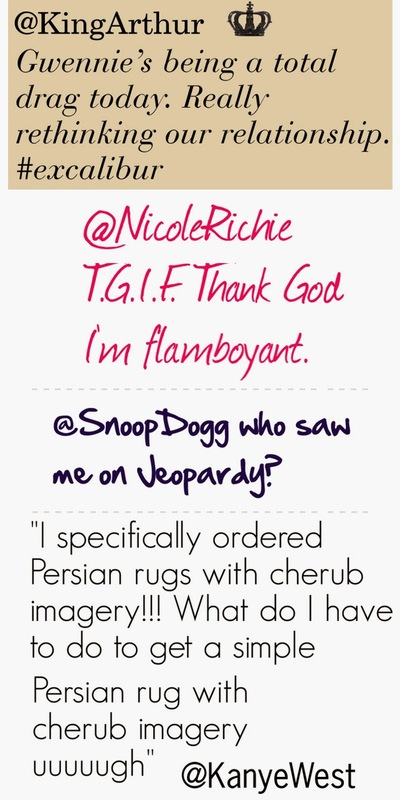 I also want a persian rug and can totally relate lol. I like all the tweets , 2B or not2B? Too funny! I have never heard of this book before! ahahah just what i need it for a saturday night!! Great post! what a witty book! Shakespeare and Monet - hilarious! What a brilliant idea for a book. Obviously full of entertaining moments. And happy, happy belated birthday, sounds as though it was a lovely one. Haha, yes, I'm so glad that you liked it. :) It's filled with a good bunch of pretty funny lines. Thanks! :) I'm sure they will appreciate it. I agree, and can see me gifting this to a few friends of my own. Thanks for reading! Yes, such a good one! There are so much more, these were just my favourites! :) Thanks for commenting. Hehe! Cla, Danke! Ja, es gibt viele lustige Zeilen in dem Buch. :-) So good for killing time too! Liebe Rena, Vielen Dank! Ja, meine Schwester wirklich versteht, gute Humor, haha! Ich hoffe, dass Sie einen schönen Anfang der Woche zu haben! Just catching up on your recent posts which I have missed while away on holiday. I like unusual, fun books like this one and it's a great little gift. You have selected some wonderful excerpts. I especially liked the Monet one!